Western gray squirrel. Photo by Joseph V. Higbee. The western gray squirrel is the largest native tree squirrel in Washington. They are dark gray with pure white underparts, and have large ears and a large tail that is as long as the body (Figure 1). Similar species include the eastern gray (S. carolinensis) and fox (S. niger) squirrels. Adult eastern gray squirrels are about 20% smaller, typically have pale gray dorsal pelage with a brown to reddish wash, and the ears and tail are shorter (Linders and Stinson 2007). Adult fox squirrels are similar in size to western gray squirrels, but have a rufous or cinnamon belly and short ears (http://wdfw.wa.gov/conservation/gray_squirrel/inde x.html). Western gray squirrels range from north- central Washington southward through the western half of Oregon to southern California (Carraway and Verts 1994). Arboreal and generally solitary in their habits, western gray squirrels mostly forage on the ground, but rarely stray far from trees. They use stick nests for resting and sleeping, and females use cavity nests for parturition and rearing of young. 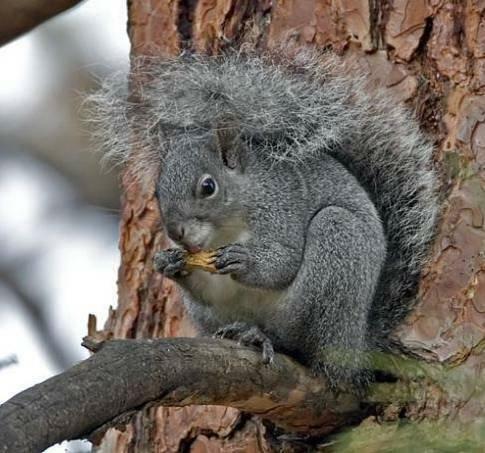 Pine nuts, acorns, seeds, green vegetation, hypogeous fungi (truffles and false truffles), and fruit are the main components of the western gray squirrel diet. Historically, western gray squirrels were more widespread in Washington, but currently occur only in three geographically isolated populations: (1) Pierce County in the Puget Trough; (2) Klickitat, Yakima, and Skamania counties in the southeastern Okanogan counties in north-central Washington (Figure 2; Linders and Stinson 2007). They inhabit transitional forests of mature Oregon white oak, ponderosa pine, Douglas-fir, and various riparian tree species (Linders and Stinson 2007). Habitat quality in Washington is assumed to be relatively poor compared to other parts of the species’ range due to the lower number of oak species and degradation of pine and oak habitats. The cumulative effects of land conversion, logging, sheep grazing, and fire suppression largely eliminated the open-grown stands of mature and old growth pine and have degraded oak woodlands (Linders and Stinson 2007). The most recent population estimate for Washington was between 468 and 1,400 squirrels, based on data gathered from 1994 to 2005 (Linders and Stinson 2007). Population size can fluctuate dramatically with disease and changes in food supply. Surveys. Hair-snare tubes, first used for detecting western gray squirrels on Joint Base Lewis-McChord (Fimbel 2004a), are a technique being increasingly used to delineate squirrel distribution, particularly where densities are low near the edge of the species’ range. WDFW, the Pacific Biodiversity Institute, and the University of Washington have conducted tube surveys in Okanogan and Chelan counties since 2007. These efforts, which included a citizen science project, have expanded the known range of western gray squirrels in both the Okanogan and Methow watersheds (Pacific Biodiversity Institute 2012). Despite significant forest changes over the last 40 years, squirrel habitat still exists in Chelan County and warrants surveys to document current squirrel distribution. In 2010, 56 hair snag bait tubes were distributed in 4 drainages of suitable habitat along the south shore of Lake Chelan in Wenatchee National Forest. Hair samples tentatively identified as western gray squirrels indicated the presence of this species in several drainages that were not known to be occupied (Gallie 2010). Prior to this effort, most western gray squirrels in Chelan County (outside of the Stehekin Valley) were only known to occur in low elevation areas (<1,000 ft), along developed areas with stands of domesticated walnut and other deciduous trees. In 2011, tubes were placed at 50 sites in 5 drainages on the south shore of Lake Chelan. Twenty-four hair samples were collected, 5 of which were possibly from western gray squirrels. These determinations await confirmation. WDFW also initiated tube surveys in the Nile valley in Yakima County in 2011. In Chelan County in 2012, 37 hair-snag tubes were placed to document current distribution of western gray squirrels. Tubes were placed at 18 sites on the North Shore of Lake Chelan, two other routes were in the Entiat Valley. No positive detections were made. Hair-snag tubes were deployed in the Okanogan watershed to document the northern extent of western gray squirrel distribution in Washington. All hairs were checked but no positive western gray squirrel detections were found. WDFW coordinated with Pacific Biodiversity Institute in the Methow which was in its third year of having volunteers run hair-snag tubes throughout private and public lands in the Methow watershed. In 2011, they recorded 629 observations at 101 hair tube sample locations. There were five population centers in the seventeen sample locations containing western gray squirrel hairs (Pacific Biodiversity Institute 2012). Two of these locations were new sightings, located more than 500 meters from a previously known site. In 2012, volunteers deployed hair tubes at 186 sample locations from French Creek to Early Winters, the Chewuch River, Twisp River and a number of tributaries; western gray squirrel hairs were captured at 10 sites, four of these sites were new. The other six sites were located in a cluster where gray squirrels had been discovered earlier. More information about their project can be found at: http://www.pacificbio.org/initiatives/wgs/squirrel-news.html . Conservation actions and research. WDFW completed a state recovery plan for western gray squirrels in 2007 (Linders and Stinson 2007) and updated its Priority Habitat and Species Management Recommendations for the species in 2010. Where forest practices occur in suitable habitat, voluntary guidelines have been developed to protect nest trees and large, mast-producing trees, and maintain the needed canopy closure and connectivity (Linders et al. 2010). Research has been conducted on all three populations in the state by WDFW and partners. Klickitat research. In 1998–1999, home range and habitat use by western gray squirrels was studied on the Klickitat Wildlife Area in Klickitat County by a University of Washington graduate student (Linders 2000, Linders et al. 2004). WDFW expanded the research in 2000 to include a site on private timberlands. From 2000–2005, 149 individual squirrels were captured and ear-tagged or equipped with radio transmitters. Radio-tracked squirrels were used to evaluate reproductive success, home range, movement, juvenile dispersal and survivorship. Mark-recapture methods on a 78–ha grid were used to estimate population densities (Vander Haegen et al. 2005). WDFW also conducted a preliminary investigation evaluating the effects of timber management on western gray squirrels in 1999–2000 (Vander Haegen et al. 2004). Stuart (2012) studied distribution, life history, and response to fire fuel treatments in the North Cascades during 2008-2011, using live trapping, telemetry, and genetic sampling. Squirrels used fuel treated and wildfire areas within their home ranges disproportionately, and found no evidence that fuels treatment negatively affected western gray squirrel diet or habitat at the home range scale. However, nesting areas had characteristics that can decrease with fuel reductions, such as large trees, dwarf mistletoe, high canopy cover, and connectivity; she suggested that fuels treatments should retain patches of large trees with mistletoe, and connectivity to protect nesting habitat (Stuart 2012). Genetic analysis suggested that population of western gray squirrels in the North Cascades of 500-1,000 individuals (Stuart 2012). Female home range sizes in her Stehekin and Squaw Creek study sites were smaller than those in Black Canyon reported by Gregory et al (2010). The population size estimate and home range size information suggest that the North Cascades may provide better habitat and support a somewhat larger population than previously assumed. The Stehekin population, although small, did not have significantly lower levels of heterozygosity and allelic richness than the Methow Valley. Genetic data indicated immigration from the Methow Valley to Stehekin. The one-way movements and higher mortalities at Stehekin suggested it might be a sink population (Stuart 2012). One male squirrel moved 37 km. Puget Trough research. An intensive study of western gray squirrel ecology on Joint Base Lewis- McChord was initiated by WDFW in 2006. Research on the resident squirrel population has focused on quantifying population parameters including survival, causes of mortality, productivity, and resource selection. This information will be critical for assessing why the Puget Trough population has contracted over the last few decades and for focusing recovery efforts. Since October 2006, 142 resident squirrels have been captured and radio-tagged, with >18,000 telemetry locations recorded for 124 animals. Mean survival of 82 resident squirrels was about 63%, similar to that observed in Klickitat County (Vander Haegen and Orth 2011). A companion study investigating potential competition between eastern and western gray squirrels was initiated by a University of Washington graduate student in 2007. 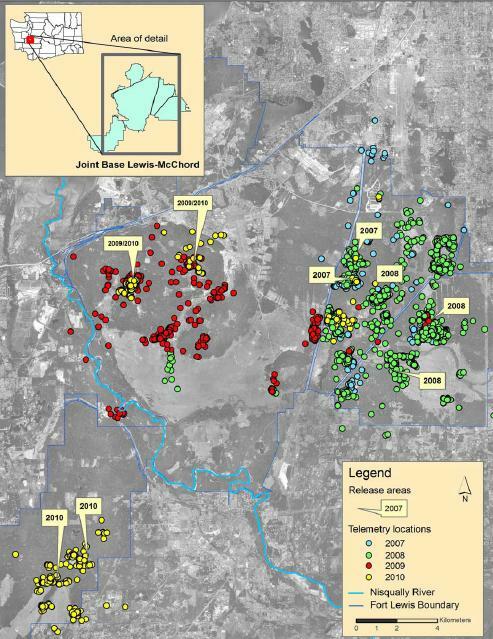 Johnston (2013) tracked eastern and western gray squirrels with radio-telemetry for four years to investigate resource use and interactions between species on Joint Base Lewis-McChord. Following a monitoring period of 1-2 years, eastern gray squirrels were experimentally removed from two sites. Dietary overlap for most food resources was high between eastern and western gray squirrels but they did not share space and had little overlap in their use of habitat types. Western gray squirrels were found primarily in coniferous uplands with little understory vegetation, whereas eastern gray squirrels were in riparian areas with deciduous trees and dense understory. Few western gray squirrels moved into areas formerly occupied by eastern gray squirrels, and he found no increases in body mass, fecundity, or survival for western gray squirrels. He concluded that coexistence of eastern and western gray squirrels appears possible where distinctly different upland and riparian habitats occur in an area (Johnston 2013). Puget Trough augmentation. The Puget Trough population of western gray squirrel faces the greatest extinction risk in Washington (Linders and Stinson 2007). Available evidence in about 2000 suggested that the population had declined dramatically since the early 1990s, when numbers were already small, and might be dangerously low (Bayrakci et al. 2001). Causes for the decline likely include habitat loss, habitat alteration, and increased mortality related to vehicle traffic (Ryan and Carey 1995). In 2007, WDFW and Joint Base Lewis- McChord initiated a cooperative plan to augment the western gray squirrel population on the base with the goal of increasing the population’s size, its genetic diversity, and its area of occupation (Vander Haegen et al. 2007). From 2007–2011, a total of 83 western gray squirrels from Klickitat and Okanogan counties and from Hood River and Wasco Counties, Oregon, were released on the base (Figure 4). Translocated animals were radio-collared and tracked as part of the ongoing ecology study on Joint Base Lewis- McChord. Survival of translocated squirrels has been equivalent to that of resident animals and numerous translocated females have produced young (Vander Haegen and Orth 2011). The augmentation project and ecology study will be completed in 2012, but additional translocations to the Puget Trough population are planned as funds are available. Oregon white oak research. The USDA Forest Service, Pacific Northwest Research Station, in cooperation with the Fort Lewis Forestry Program, initiated a study of the response of Oregon white oak to release from overtopping by Douglas-fir and to different methods of planting oaks (Devine and Harrington 2004). Preliminary results suggested that full release of oaks rather than an incremental release may be more beneficial for oaks in the Puget Sound region (Devine and Harrington 2004). In addition, the PNW Research Station has been conducting research on the factors affecting acorn production (Peter and Harrington 2002, 2004). These studies may help in improving methods of habitat enhancement for western gray squirrels. The Nature Conservancy was also involved in oak release and habitat restoration on JBLM (Fimbel 2004b). Partners and cooperators: Joint Base Lewis-McChord, University of Washington, National Park Service, U.S. Forest Service, The Nature Conservancy, Washington Department of Natural Resources, Klickitat County, Yakama Nation, Oregon Department of Fish and Wildlife, Pacific Biodiversity Institute. Bayrakçi, R., A. B. Carey, and T. M. Wilson. 2001. Current status of the western gray squirrel population in the Puget Trough, Washington. Northwest Science 75:333-341. Carraway, L. N. and B. J. Verts. 1994. Sciurus griseus. Mammalian Species 474:1-7. Devine, W., and C. Harrington. 2004. Garry oak woodland restoration in the Puget Sound Region: releasing oaks from overtopping conifers and establishing oak seedlings. 16th International Conference, Society for Ecological Restoration, August 24-26, Victoria, British Columbia. Fimbel, C. 2004a. Monitoring squirrels on Fort Lewis. Draft Quarterly report April-June. The Nature Conservancy Olympia, Washington. 3 pp. Fimbel, C. 2004b. 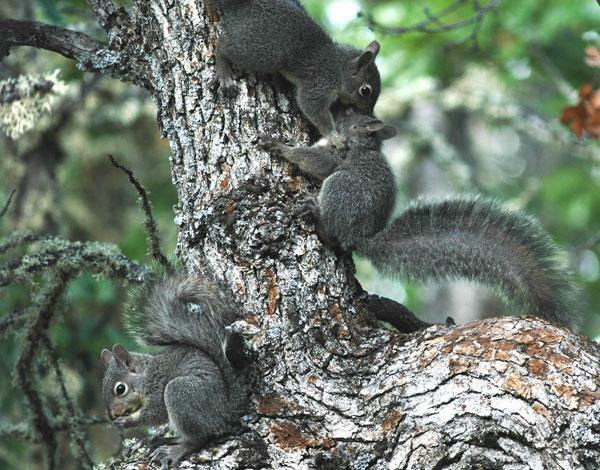 Strategies for enhancing western gray squirrels on Fort Lewis. The Nature Conservancy, Olympia, Washington. 39 pp. Gallie, J. A. 2010. Western gray squirrel hair-tube surveys in Chelan County, North Central Washington: 2010. Washington Department of Fish and Wildlife, Wenatchee, Washington. Gregory, S. C. 2005. Seasonal movements and nest site selection of the western gray squirrel (Sciurus griseus) in the Methow River watershed. M. S. Thesis, University of Washington, Seattle. 92 pp. Gregory, S. C., W. M. Vander Haegen, W. Y. Chang, and S. D. West. 2010. Nest site selection by western gray squirrels at their northern range terminus. Journal of Wildlife Management 74:18–25. Johnston, A. N. 2013. Eastern gray squirrel ecology and interactions with western gray squirrels. Ph.D. Dissertation. University of Washington, Seattle. 143 pp. Linders, M. J. 2000. Spatial ecology of the western gray squirrel, (Sciurus griseus) in Washington: the interaction of season, habitat and home range. M.S. Thesis. University of Washington, Seattle, Washington. 99 pp. Linders, M. J., and D. W. Stinson. 2007. Washington State recovery plan for the western gray squirrel. Washington Department of Fish and Wildlife, Olympia, Washington. 131 pages. Linders, M. J., W. M. Vander Haegen, J. M. Azerrad, R. Dobson, and T. Labbe. 2010. Management recommendations for Washington's priority species: western gray squirrel. Washington Department of Fish and Wildlife, Olympia, Washington. Pacific Biodiversity Institute. 2012. Western Gray Squirrel Distribution in the Upper Methow Valley, Washington. 2012 Report 46 p.
Peter, D. and C. Harrington. 2004. Oregon white oak acorn production study: five-year report. USDA Forest Service, Pacific Northwest Research Station, Olympia, Washington. 30 pp. Ryan, L. A. and A. B. Carey. 1995. Biology and management of the western gray squirrel and Oregon white oak woodlands: with emphasis on the Puget Trough. USDA Forest Service, Pacific Northwest Research Station. General Technical Report PNW-GTR-348. Portland, Oregon. 36 pp. Stuart, K. D. 2012. Ecology and conservation of the western gray squirrel (Sciurus griseus) in the North Cascades. Ph.D. Dissertation, University of Washington, Seattle. 239 pp. Vander Haegen, W. M. and G. R. Orth. 2011. Western gray squirrel ecology and augmentation of the population in the South Puget Trough. Progress report. Washington Department of Fish and Wildlife, Olympia, Washington. 16pp. Vander Haegen, W. M., S. C. Gregory, and M. J. Linders. 2007. Implementation plan for augmentation of the western gray squirrel population, Fort Lewis, Washington. Washington Department of Fish and Wildlife, Olympia, Washington. 34pp. Vander Haegen, M., G.R. Orth, and L. M. Aker. 2005. Ecology of the western gray squirrel in south-central Washington. Progress Report, Washington Department of Fish and Wildlife, Olympia, Washington. 41 pp.